OK so in August '08, I made Leaf Me Alone in grey. I liked it, but I thought it could be better. 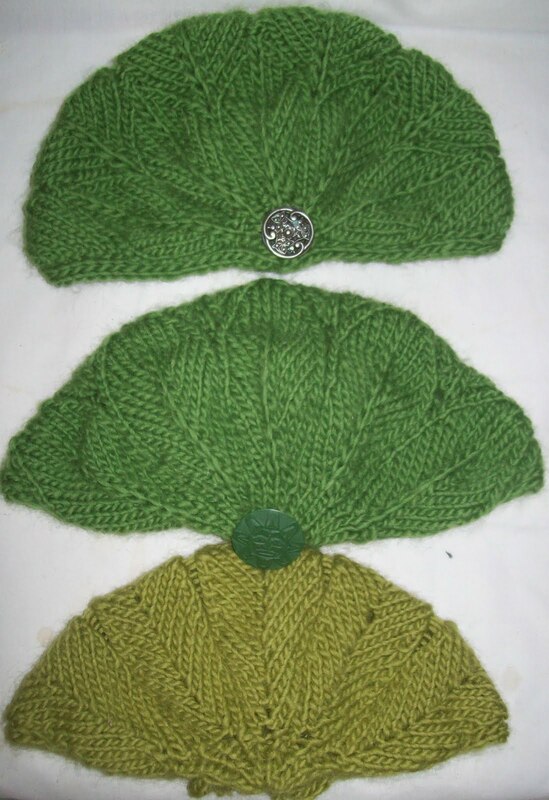 This week, 3 more tries—improvement 1 of the design was green wool—a safe color. The 1st version (bottom of image) is too small. 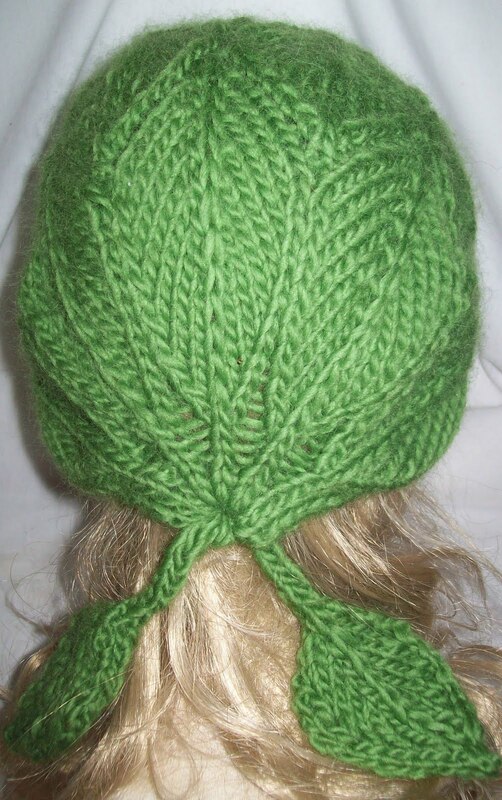 The band around the head is fine,--(seen here as width, but actually a function of rows, or length) but there isn't enough of a crown -(more stitches are needed side to side to make it taller) to make it a good hat. And it suffered from the same “leaves are too long and narrow” problem that the original design had (making 5 leaves instead of 3 didn't help)--in fact, 3 leaves look better than the 5. Scratch the first version! Version 2 (center) is almost as long ( wide) as version 1, and has more stitches at the crown(width) , and 2 tiers of leaves. A better fit, and the leaves are clearly leaves. But.. the band is too narrow, and the shape isn't perfect. Version 3—Smaller, rounder leaves, 3 tiers of the leaf motif, so its easy to see the leave shape, a wider band that is actually shorter --(making the hat in the folded flat view look narrower), with WAY more stitches in crown to make a fuller hat, this hat sits on the head, and feels more comfortable with a slightly snugger band. All three four hats are novelty construction--Not brim to crown, or crown to brim, but forehead to nape of the neck (or if you prefer, ear to ear.) 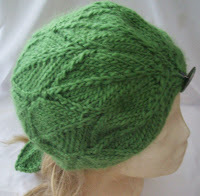 --It's fun to knit hats in a totally different direction—and it opens up possibilities of stitch patterning. I have thought of making small leaves (like the ones in back) or a small knit flower..but maybe a button, or pin.. SOMETHING—the perfect detail eludes me. I might go to a craft store and look for a special button, or maybe a large bead to finish the front. All the versions end with a small tube (simple double knitting and a tubular/grafted bind off) that has been threaded with a length of I cord and has a double layer knit leaf at each end—as a sort of tassel. This provides an adjustable tie to fine tune the final fit of the hat—and is just a perfect fillup needed. Today, I am going back to candy corns, and to pattern writing purdah to document this hat. Then Leaf Me Alone(3) is morphing into another hat: Frost Flowers—similar—but totally different!